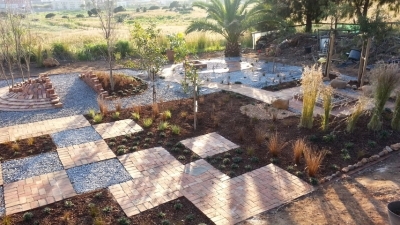 Armed with 600 pavers, 300 bricks, ornamental gravel and a selection of planting material, Landscape Technology students had just two weeks to completely transform a section of vacant land at the Cape Town Campus. This daunting challenge was part of the inaugural CPUT-Corobrik Construction week that gave all students in the department the opportunity to hone their skills on a hands-on landscape installation. Lecturer Deon Bronkhorst says the challenge kicked-off with a series of lectures on paving techniques which was facilitated by Corobrik representatives. “We then divided the students into four groups and tasked each to come up with their own unique design that had to promote Corobirk and the use of pavers and bricks,” says Bronkhorts. The students did not disappoint, coming up with striking designs which were lauded by a panel of judges from CPUT, Corobrik , the South African Landscape Institute and the South African Council for the Landscape Architectural Profession. Lecturer Johan van Rooyen says the project fits well with the course, which has a strong emphasis on construction. “The project was challenging, but we all gained a lot of experience from it. We had to dig foundations, mix concrete and even do a bit of building work,” says third-year student Thandokazi Sesmani. BTech student Christiaan Jonker says hands-on and interactive projects allows students to hone the skills needed to survive in their competitive industry.